I hope you had a great start in the week. I just started my holiday so yes, I can say is that it is a great start indeed. Last post was a little confusing, I started writing it on Friday but at the time I finished it, it became Saturday, which was my birthday. Thanks so much for all of your nice wishes. It was a lovely night, restaurant and food were really good. As a nice surprise the moon rose from the back of Heidelberg Castle and it looked so lovely. I really would like you to see that so I am attaching a photo I have taken at the end of this post. I took it with iPhone and the lighting was a little tricky but I think you can get the idea. 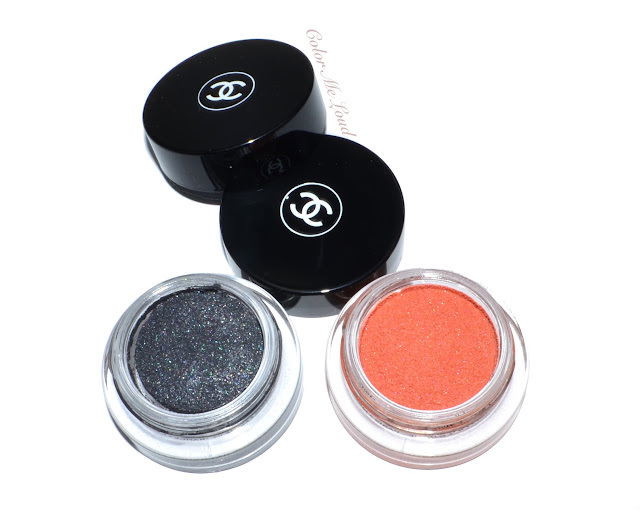 Back to make-up, I would like to show you two Illusion D'Ombres from Chanel Les Automnales Collection for Fall 2015 and share my thoughts, right after the jump. In the States there are three shades being released with this collection, one of them being New Moon from last year's summer collection (reviewed here). If you are expecting to get it in Germany, I am sorry to tell you that you might be out of luck because it is probably not coming here. Some of you asked if it will be released in UK, I unfortunately only have local PR information and not for all the countries so I hope you gals are luckier than we are and get it. With this collection Chanel introduces a new formula of their rather sheer and shimmery Illusion D'Ombres, called Illusion D'Ombre Velvet. I think both #106 Fleur de Pierre, an anthracite with satin finish and Rouge-Gorge, a mid-toned orange with satin finish and pink shimmer are less shimmery than the previous formulas. Strange enough only Fleur de Pierre is called a Velvet whereas Rouge-Gorge is given as a regular Illusion D'Ombre. Rouge-Gorge is an unusual pumpkin shade if I may call it that. So perfect for Fall (and Halloween!) I am right now loving it as a base to other palettes in the collection and I will post how it pairs with Entralacs Palette in a few days. I believe this one might be especially flattering with blue eyes. Both of the shades apply beautifully, blend nicely. They are sheer at first application but can be build up. 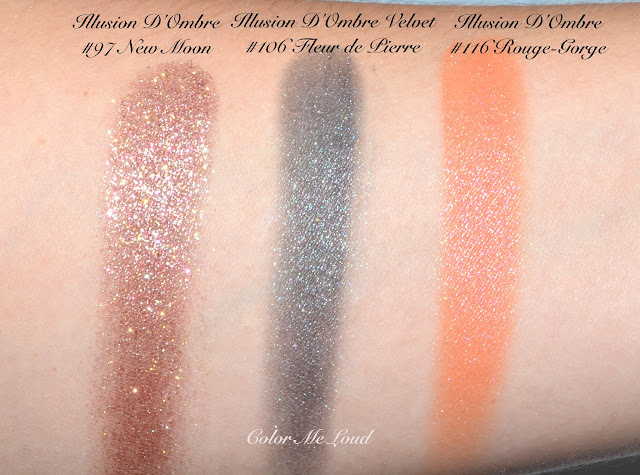 I love Illusion D'Ombre myself but have heard many complain about the shimmer. Those of you will love new Velvet formulation. I found that both Fleur de Pierre and Rouge-Gorge apply better with a cream eyeshadow brush although I like using my hands with most of the other IdOs. 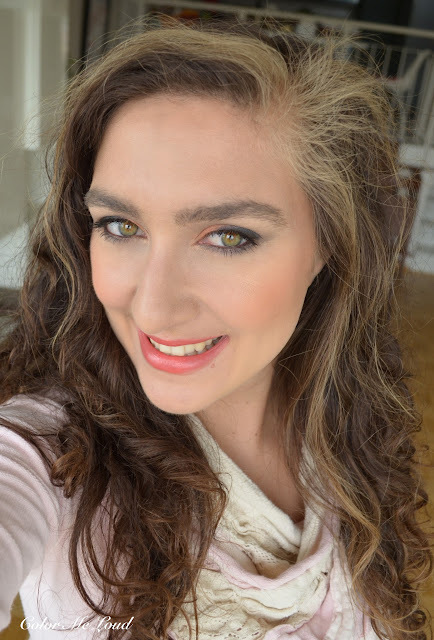 Today I am very excited to show you another one of my "Sara's terrible make-up looks as usual" as some readers in Cosmo Forum in Russia put it. See, that is my passion! I put so much effort trying to get luxury make-up as early as possible. This includes lots of planning ahead, a friend who helps me place the order and get things on time as well as packing them and send to the hotel where my hubby is staying. Although it is Grand Hyatt, they manage to lose the package and it takes many phone calls to find it. I don't even want to tell how much more I have to pay because things got so expensive in the States, then all the time I put into taking photos, writing posts. All of these efforts and money are for my dear Cosmo Forum readers, who can then use my post to make fun of me and satisfy their gossiping/bitching activity of the day as they sip their tea in the morning. Am I not devoted? Here I am going for the most unblended look because I can! Not because I am rushing in the morning as I am a working woman and don't have 2 hours to work on the eye look in the morning. Instead it is just because I would like to be talked about. I am addicted! As for the other readers, I think you can see both of the shades nicely. Pumpkin shade Rouge-Gorge which I am loving is on the inner corner, Fleur de Pierre is on the outer corner. I blended over the crease with MAC Omega and applied Effortless Kohl Eyeliner from Burberry in shade Black on the water line and along the lash line. Here is the full look. I am wearing MAC Freshen Up (reviewed here) on the cheeks, Bareminerals Pop of Passion Lip Oil Balm in Tangerine Pop (review coming up soon) on the lips. And here it is, the beautiful view from one of the historical bridges in old town Heidelberg, looking at the illuminated castle and the surprise full moon rise right beneath it. The view was breathtaking, unfortunately hard to capture (with iPhone) too. But I think you have the idea. Heidelberg castle, moon is rising. Final thoughts: I am loving the new formulation of Illusion D'Ombres with less shimmer although I liked it with shimmer too. Both of the shades are great on their own or applied under the palettes. I especially like Rouge-Gorge under Entralacs (review coming up). How would you wear this pumpkin shade? Any ideas/tips? Sara I think your looks are very unique and beautiful and I for one who lives in the U.S. love your blog so much because uhh always get everything before I even see it online your hard work and dedication don't go unnoticed and for those of us that truly appreciate you I say screw them. Lol you are lovely and give me something to try to recreate as i only do one shade on my lids. Honestly the fact they take that much time and effort to complain about you, your doing something right and they're just jealous. Lots of love from New England. Rouge-Gorge looks really beautiful! This is not a shade I was attracted to but after seeing your swatch, I can see this work! And so sorry for the harassment you are suffering. I pity people who have nothing better to do than make fun of others. They're usually the least creative, least interesting people I know. Hi Sara. Never commented but you have become my go to blog for all luxury makeup items. You're funny, entertaining, refreshing, and honest. As a professional and a mother, I, too don't have 2 hrs to get ready...so if my makeup doesn't look like an instagram make up artist post-so sorry! Point is keep on what you're doing and forget the haters, besides most of them are just jealous! Much love from California. Thanks for all that you do! Je vous lis depuis très longtemps, sans jamais commenter, la barrière de la langue m'en empêche ! Je voulais réagir aux commentaires moqueurs dont vous faites l'objet et vous dire que la jalousie est le moteur de leurs bêtises ! J'ai hâte de voir les nouvelles Illusions d'ombre, je suis fan de ce produit et Rouge_Gorge est magnifique, je le verrai bien porter avec du burgundy ! OOOO to be honest, I didn't think much about the two Illusion d'Ombres I don't own until now! You actually make them look wearable and pretty together! As for the horrible comments... Some people are just vicious and I say let them go. I never really bother to find out what people say. This is probably a head in the sand strategy, but it makes he happier! I try to read the comments because I get feedback from them. This is how I found out that my face shots were a bit dark in the beginning. Also sometimes there are good comments to motivate too. As for the feedback "this is so terrible" is not a feedback in my book. There is nothing I can take from it. One has to write why? what could be done better etc. Still it disappoints. The orange one is so interesting so I had to get it :-) I love it more as a base but like that, yes it can be worn, to some extend lol. Hi Sara. Your blog is on my Reeder feed and I always look forward to your posts. Ignore the haters. As for the eyeshadow, the Rouge Gorge is so pretty on you. I don't know if I could pull that color off with my pale complexion but it looks great on tan skin! I have never commented anything on your blog though I read it for more than a year now. Yours is one of a very few resources on makeup I go to regularly. It is extremely useful! It helps me target the products I am interested in and avoid making costly mistakes. I love your comparisson swatches and appreciate greatly the speed with which you come with the new products of the season. And being a mother of three children I enjoy reading your graceful reviews that help me be distracted a little from my motherly routine )) Please don't be offended by rude people, most of those who appreciate just do not comment! Am so happy so that so many of your followers have written to support you. And I agree with everyone. As someone who can afford to sometimes buy, wear, and hopefully look okay in high end makeup— and who has the time to read and comment on beauty blogs, like this one, (which is one of my favorites and a daily read), I try to never lose sight of how fortunate and privileged I am compared to many other people in our world. So to me, anyone who takes that good fortune and uses it to trash others is misguided. That being said, beauty and taste are a matter of opinion, and each of us has a right to our own, which is why I salute you for trying to learn from it, and being frustrated by the immaturity of the communication. While it can be best at times to ignore unpleasant comments, I like to be very careful before I dismiss people as haters. Not everyone who has a different opinion is a hater, which is why I don't like to label people that way. Learning how to respond to triggered people without becoming triggered oneself is one of the arts to cultivate to avoid everything from simple interpersonal conflicts to wars. I am always working on that. I recently had a guy come onto my Facebook page (friend of some friends) who used a tactless photo as a profile picture— and made political remarks offensive to many of my other friends. I wanted to block him immediately, but I also felt concern about censoring him. I allowed his remarks to sit. No one responded to them. When other threads took over my page several days later, I quietly un-friended him. It is so wonderful that people from everywhere get to meet in this pleasant and beautiful space and admire beauty products together. I sometimes seek a respite from outside things by coming into this space. But when I remember all that goes on in the greater world, and all of the different kinds of harshness that people suffer, I am not surprised that some of it intrudes even in beauty blogs. And as much as I don't like it's being misdirected towards you, with all the goodness in yourself and in your life, you can handle it. Sorry for my english...désolée ! Hi Sara! I'm one of your readers from the states. I Please don't let negative people get to you. Their misery only allows them to see the negative. Let us rejoice in our happy lives and the miserable ones will wallow in their misery 😂 Having said that, I adore your blog. Please don't change a thing. My eye looks end up looking a lot like yours and I love it. I am busy and have children to take care of, so I can only indulge in my makeup obsession for limited periods of time. It may not be the most perfectly blended or meet someone else's standard, but I am happy and that is all that matters. I suspect it is the same with you. That is how it goes when one has a busy, happy life: You don't feel the need to bow to anyone else's standards. Miserable b*tches take note. Happy Birthday Sara!! Love the swatches of New Moon, looks like stardust. And absolutely love the eye look you did with the pumpkin and gray shadows. Ignore the gossipers--- haters will hate, and they hate themselves most of all. I'm a working mom, and I only have 20 minutes to do my whole face, so if it doesn't look perfect, that's the way it goes. Thank you for your hard work and dedication! About the makeup: I also got rouge gorge and FP. New moon is sold out everywhere near me. I have darker skin (MAC nc50) so on me Rouge gorge looks like a satiny, peach with slight pink duo chrome. It's so hard to describe but it looks like an interesting neutral color that makes my brown eyes look rich. I normally wouldn't go for a color like this but I really like it. I did a look just like yours above and it looks so different on me (not orange at all) but still so lovely. thanks for taking your time to comment. I was so disappointed to put so much work and being made fun that way. For a moment I thought, I am spending my time in something stupid, if you know what I mean. Yes it is silly in the pot, lol, exactly that. It is like pumpkin isn't it. But looks wonderful on the eye. Also under the palette as well, I will show that in a few days. Hi Sara! I absolutely love, love, love the look you pulled together. I only glanced at the illusion d'ombres, but you have me lemming for the orange one now. I don't even wear orange, but I must have it! On a side note, I love your posts! I love your enthusiasm even though your collection is so large, and I actually like that some of your eye looks aren't super blended because it gives me a better idea of the color. Obviously, your readers in Cosmo Forum like you as well; otherwise, why would they keep coming back to your site? LOL.They're just jealous, I tell ya! Keep up the good work! Long time reader, first time commenter. I personally love your makeup looks, you always seem to be able to make interesting color combinations work for you, colors that I would never think to combine myself! Every person who has a major presence on the internet has some dissenters, bored sad people who have nothing going on with their lives and just seek to bring other people down. It's just unfortunate. Keep doing your thing! You have lots of fans! Happy Birthday Sara!! I love that orange shade!! Btw, your makeup looks are ALWAYs stunning and sophisticated. I have no idea what those women on the Russia Cosmo Forum are on. Ugh..pisses me off! If the criticising girls are also up-to-date on your activities, then I suppose it shows that this homepage is popular even with them. 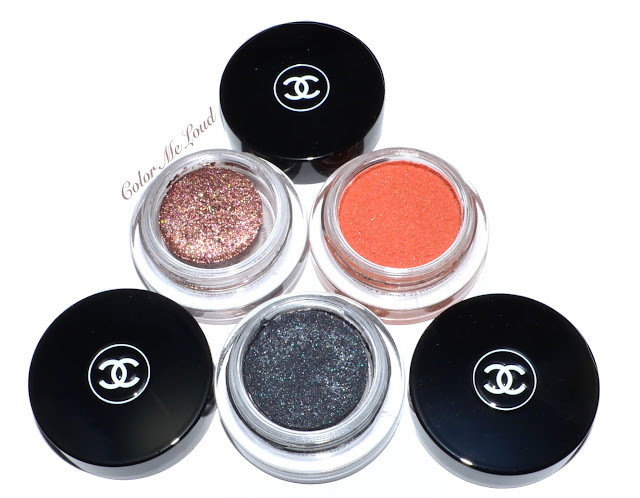 I was looking for swatches of the rouge gorge and applied so i can see if its that orange and if the shimmer is apparent. Sometimes if the base is too strong the shimmer doesnt show, i think thats the case with this one can you do comparison swatches?thanks anyway. As for your skills i find them better than most so dont worry. My thoughts on the subject is that i care about the opinion of people who know and care about me, people that i dont know cannot have an opinion about who or what i am, even more so of people who often find it easy to bash someone online. its one thing to have an opinion surely everyone is intitled but how you voice that opinion is an aspect of your character and upbringing. I dont wish to offend anyone by my comments. Keep up the good work! I am really intrigued by Rouge-Gorge...I'll be very curious to see how you pair this with Entrelacs. Les IdOs are one of my favourite formulas and I can't wait to play with these in person! Love your lip colour here, too. Hi Sara, i'm so confused, i really love the eye look you came up with!!! And gosh people are so nasty on forums!! Anyway, I'm glad you had a lovely evening in Heidelberg, that's 1 city I've always wanted to visit but never had the chance to. Blessed birthday my dear, you look stunning! And it's going to be an AWESOME YEAR ahead!!! I am so glad that you took your time to leave this comment. I was thinking my way of make-up is not appreciated in Russia but the way you write it, gosh, 3 kids, you are even busier than I am :-) My true respect and I am very happy to be able to distract you from time to time a little. "What kind of a blogger are you? You haven't swatched Envy Lipsticks yet!" Now I think there is a certain expectation from a blogger. Most of the time it is forgotten that I work and have another life outside this space. The same mind told my make-up looks are terrible because they expect something super polished, made fit and even photoshopped. I am so sick and tired of photoshopped make-up looks. I once used filters over my FOTDs and in the same forum I saw people liking it. This bare truth is not appealing to many. I think I have to do what you do here. Silently unfriend, meaning I shouldn't read this forum again since it doesn't give me a valuable opinion at the moment. Thanks for stopping by and leaving this comment. I always love reading from you. Thanks so much for your lovely encouraging comment. I love your english, nothing wrong about it. You should hear my (non existing) French lol. Thanks very much for the swatches and the detailed formula descriptions. As far as Internet trolls are concerned, they're pathetic little people and it's sad that they can only feel important by trying to tear others down. Screw them. Sara as always such a nice look ! I can't believe how mean some people are! But at the end of the day it's only yourself and your work that are most important. If you still feel satisfied of what you have achieved then anything else doesn't really matter! I really love the way you review make up with such a realistic and humorous way. I can see myself many times just typing your blog on my browser in order to forget my day's problems.and this is a real big deal I can tell you! I guess your blog had the same effect in other people too.keep up the good work and never look at what mean people have to say! As ancient Greek tragedy writer Aishylos used to say: you cannot be admired without be envied.i think this says it all! Oh regarding Rouge Gorge: You convinced me of getting it! Again! Pay no attention to rudeness. Your readers appreciate all of you hard work and dedication! Fleur de Pierre looks lovely. I wonder if it contains talc (can't wear it). What the ever living F?? If those people call your looks terrible then they need to stick to looking at photoshopped editorials! Your makeup has always been exquisite and inspiring! Dont listen to those haters! Rouge-Gorge looks lovely on you, and now I'm lemming Velvet to pair with it! Sara! I'm from Russia exactly from Saint-Petersburg and i'd like to apologize for those tactless guys who treat you in such a way. Don't pay attention to people who can't behave. Thanx 4 your timely swatches. Press on regardless & get to us news from the world of beauty!! !